Can CBD oil, the ketogenic diet, and whole body vibration translate to better health? And why should people abstain from statins? 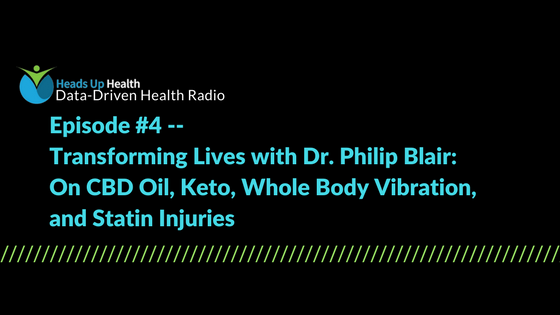 In this episode, we chat with Dr. Philip Blair, a board-certified family practitioner and a retired military officer from West Point who does many things to help people transform their lives, including education about CBD oil, low-carb and ketogenic diet approaches, statin injuries, and disease management. He also provides consultations regarding cannabidiol (CBD) from industrial hemp. You can find Dr. Philip Blair at Pro Health Advisor and on Facebook. Have episode suggestions? Email us! Use our discount code — 10off1079 — and get 10% off on your purchase of Elixinol!